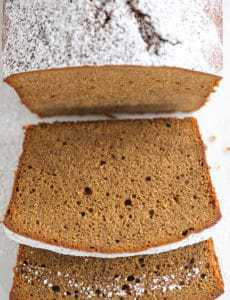 This gingerbread pound cake has the texture of a classic pound cake with all of the molasses and spice flavors of a traditional gingerbread. Preheat oven to 325 degrees F. Spray an 8 ½” x 4 ½” loaf pan with non-stick cooking spray and line with parchment paper. In a medium bowl, whisk together the flour, baking soda, salt, gingerbread spice (or ginger, cinnamon, nutmeg, cloves and allspice); set aside. In a small bowl, whisk together the molasses and sour cream; set aside. Using an electric mixer on medium speed, beat together the butter and brown sugar until light and fluffy, about 3 minutes. Add the eggs one at a time, beating well between each addition and scraping down the sides of the bowl as needed. Reduce the mixer speed to low and add the flour mixture in three additions alternately with the molasses mixture, starting and ending with the flour. Mix just until smooth. Give the batter a final stir with a rubber spatula to ensure all of the ingredients are incorporated. Scrape the batter into the prepared loaf pan and smooth into an even layer. Bake until a thin knife inserted into the center comes out clean, 1 hour 20 minutes to 1 hour 30 minutes. Allow the cake to cool completely in the pan set on a wire rack. Remove the cake using the parchment paper, dust with powdered sugar and serve with fresh whipped cream. Leftover cake should be wrapped tightly in plastic wrap and kept at room temperature for up to 5 days (it can also be frozen for up to 2 months).